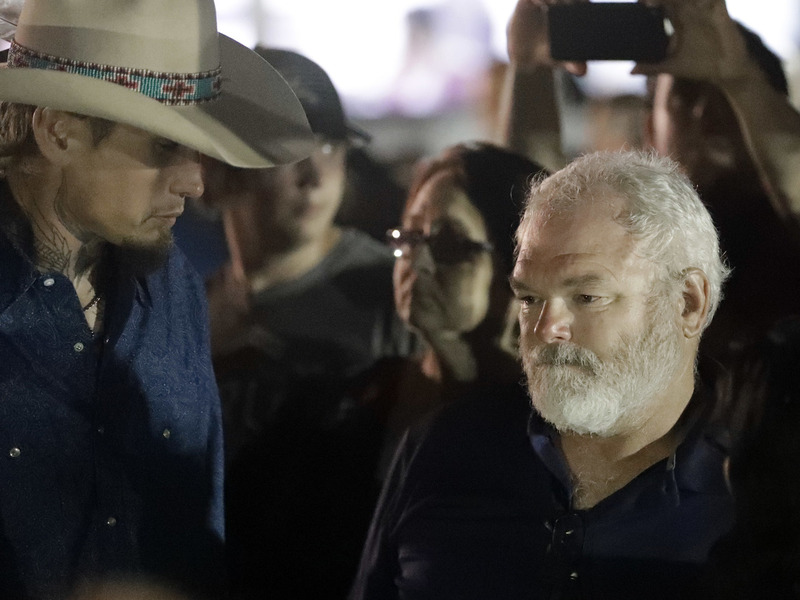 Man Who Exchanged Fire With Texas Shooter: 'I Was Scared To Death' : The Two-Way Stephen Willeford, a former NRA instructor, said he knew that each shot fired in the church "represented someone" and that he acted despite being scared for the victims, himself and his family. The men who chased down the Texas shooter — Stephen Willeford (right) and Johnnie Langendorff — attend Monday's vigil for the victims of the First Baptist Church shooting in Sutherland Springs, Texas. The Sutherland Springs, Texas, resident who exchanged gunfire with the suspect in Sunday's mass shooting at a church insists he is not a hero, saying that he was "scared to death" during the encounter. Willeford says his daughter alerted him to what sounded like shots being fired at the nearby First Baptist Church. That is when, he said, he got his rifle out of his safe. "I kept hearing the shots, one after another, very rapid shots — just 'pop pop pop pop' and I knew every one of those shots represented someone, that it was aimed at someone, that they weren't just random shots," Willeford said. "I was scared to death, I was," a visibly shaken Willeford told the television station. "I was scared for me. I was scared for every one of them and I was scared for my own family that lived less than a block away." When he saw the suspect, identified by police as Devin Patrick Kelley, the two exchanged gunfire. Kelley was reportedly wearing tactical gear and wielding a variant of the AR-15 rifle. Langendorff told KSAT that Willeford "came to my vehicle in distress with his weapon" and said " 'we need to pursue him. He just shot up the church.' "
Langendorff said he and the other man pursued the shooter at high speed before Kelley appeared to lose control and go off the road. "The other gentleman jumped out and had his rifle on him and he didn't move after that," Langendorff told the TV station. Kelley's vehicle, a truck, hit a road sign and flipped before landing in a ditch, KHBS/KHOG says. Willeford says he put his rifle on the top of the truck and yelled to the suspect: "Get out of the truck, get out of the truck" but never saw any movement until law enforcement arrived a few minutes later.